Filtration vs. Separation – Multiple Technologies for Solutions You Need! Multiple Technologies for Solutions You Need! « Happy National Engineers Week! Industrial Coolant Filtration and Manufacturing terminology isn’t exactly a language that comes native to everyone. Here, we will briefly discuss the differences between filtration and separation, to shed some light and understanding on the details unique to each technique, and some applications that best suit them! First off… some background! Solid contaminants are removed from metal working fluids and coolants by either filtration, or separation. While the terms filtration and separation are often used interchangeably, there are important differences which must be understood and considered when selecting equipment for a particular application. 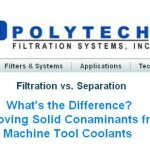 Polytech has a published Technical Article that extensively outlines the details of the differences between Filtration and Separation… however, here is the abridged version! Separation uses the physical characteristics of the solids to remove them from the liquid. The two principal means of solids separation in coolants and metal working fluids are gravity separation and magnetic separation. The appeal of separation is its simplicity, but, as with most things, the devil is in the details. The key to effective separation is that the separating force must overcome the resistance of the liquid to the movement of the contaminant within the time available. In a tank or pond heavier solids settle out of suspension. If the pond is still, even very fine particles settle out eventually. Most people can’t afford to have their fluids sitting around, so the model is more like a flowing stream and the rate of settling becomes paramount. Just as a stream runs clear at low flows and carries off rocks during flood, the dwell time or turnover rate in a coolant tank is an important measure of separation as a viable option. In general, if the bulk of the solids will settle out of suspension in 10 to 20 minutes, gravity separation and settling may be a good option. Of course success comes at a price. Good separation systems soon fill with solids so a means of removal is necessary. Labor on all but the smallest, simplest systems generally precludes manual clean out so a drag conveyor may be needed to remove solids. Learn more about the characteristics of separation, here. Filtration involves passing the liquid through some material to remove the contaminants. Filtration has two essential elements. A barrier material the liquid can pass through (filter media) and a difference in pressure between the two sides of the filter material to move the liquid. The type and format of filter media and the means of applying the differential pressure define the basic filter system. The filter media, the characteristics of the solid contaminants, the required coolant flow rates and the available differential pressure all influence filter sizing. In coolant filtration the differential pressure is usually applied by gravity, atmospheric pressure (vacuum filters) or pump pressurized systems. Gravity filter systems utilize the head pressure of a pool of liquid to create the higher pressure with differential pressures of 0.2 – 1 PSI. Vacuum filters create a lower pressure beneath the filter media so that the atmosphere, at 14.7 PSI, forces liquid through the media . Air blower vacuum systems can provide 2 PSI differential pressure. Centrifugal pump suction based vacuum filters can provide up to 5-6 PSI differential pressure. Kinetic fluid pump based vacuum filters can provide up to 13 PSI differential pressure. Pressure filters start at 15 – 20 PSI differential and in special cases go up to as much as 250 PSI differential pressure. Learn more about the characteristics of filtration, here. And there you have it! Separation uses the physical properties of the material itself to isolate contaminants, and filtration uses some kind of a barrier (e.g. Filter Media) that selectively allows permeability to isolate the waste. It’s important to notate the differences when selecting the appropriate solution for your filtration needs, to ensure optimal productivity and efficiency depending on your application. To learn more about Polytech’s filtration solutions, check out our detailed Selection Guide, which allows you to choose and learn more about the proper machine or device by your operation, and coolant type. Thanks for reading! Environmentally Conscious? Then Green Filtration Is For You!